A central London meeting space for any event. Their spaces have been beautifully renovated and also offer all the digital functionality 21st century organisers and delegates expect. Whether you’re holding a full day of meetings which requires live streaming, high spec lighting and digital branding or a straight forward presentation, your needs will be expertly met at IET London: Savoy Place. Our favourite space at IET London: Savoy place is the Maxwell Library. 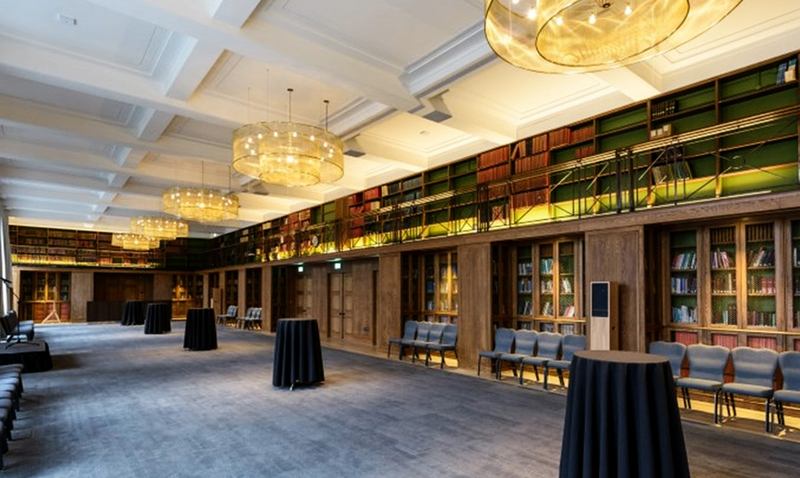 A large and unique event space featuring elements of the old IET Library and two private riverside balconies for stunning views across London. The room can hold up to 190 guests and is perfect for larger team building activities and corporate events. From light refreshments to BBQs or formal dinners their in-house catering team, Harbour and Jones will keep your guests happy. Their catering team design and serve delicious, locally-sourced menus to compliment your event. Their location in the heart of London means that IET London: Savoy Place is fully accessible by all major transport links in the capital and has a fantastic selection of local accommodation, which we can help arrange for you. Their stunning, historic building’s central London location also means your guests can enjoy fantastic access to the wealth of the capital’s restaurants, shows and sights.